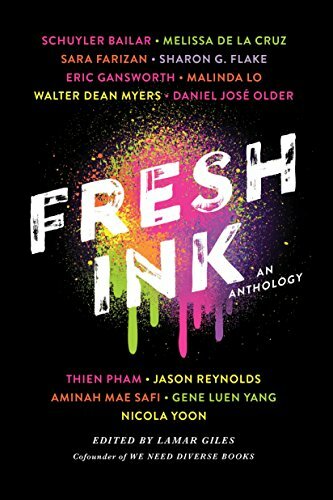 Several months ago, I received an ARC for this anthology, Fresh Ink. It’s been sitting in my Kindle for far longer than I’d care to admit. I remember reading the description and thinking it sounded so interesting and, well, fresh. And then, I guess I just forgot about it. Recently I was roaming the shelves of Barnes & Noble (because, you know, I don’t have enough books to read at my house, sitting on a shelf, unread and gleaming for my attention), when I saw Fresh Ink sitting on the shelves. I always feel so happy when I see the ARCs I’ve receive come to fruition as books on the shelf. It’s not a pride–it’s not like I discovered them or anything. But it’s so nice to seem them out and published and able to be in people’s hands. Usually, though, I also finish the ARC before it’s on the shelves. So, to make sure my joy was appropriately placed, I dusted off my Kindle and read my way through this anthology of short stories. I was pleasantly surprised when I started this collection. I expected a typical collection of short stories. This was no typical collection of short stories. As the information clearly states (I’m just not a very thorough reader sometimes) this collection is told in nontraditional ways. There are short stories by new, diverse authors. But there’s also a one-act play. And a graphic story. I, personally, love graphic novels. I’ve added a ton of them to my classroom collection lately, and I totally support my students reading them. It was a nice change of pace when this one appeared. From the first story, the tone of this collection is set. Fresh Ink opens with “Eraser Tattoo,” the story of first love and lost love. Two teenagers must say goodbye to their first loves. The story takes the reader through a series of flashbacks, as well as the present, to tell the story of unequal love. Something in the way Jason Reynolds tells this story is so real about the way teenagers love. Other authors include Melissa de la Cruz (of Descendants and Witches of East End fame) and Nicola Yoon (author of The Sun is Also a Star and Everything, Everything). Sadly, I am not familiar with the writing of most of these authors. Which is exactly the purpose of the #WeNeedDiverseBooks movement co-founded by the editor of this collection, Lamar Giles. All in all, I enjoyed my time with Fresh Ink. I wish, much as I said about I’d Rather Be Reading that I’d savored this book a little more. It’s a wonderful book rife with unique voices and diverse points of view. I thoroughly enjoyed my time with Fresh Ink. My only disappointment was that it ended too quickly and had far too few stories.